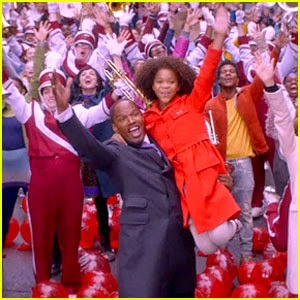 In perhaps the most anticipated and widely-promoted adoption-relevant movie of the year, Sony Pictures revisits the story of Annie. 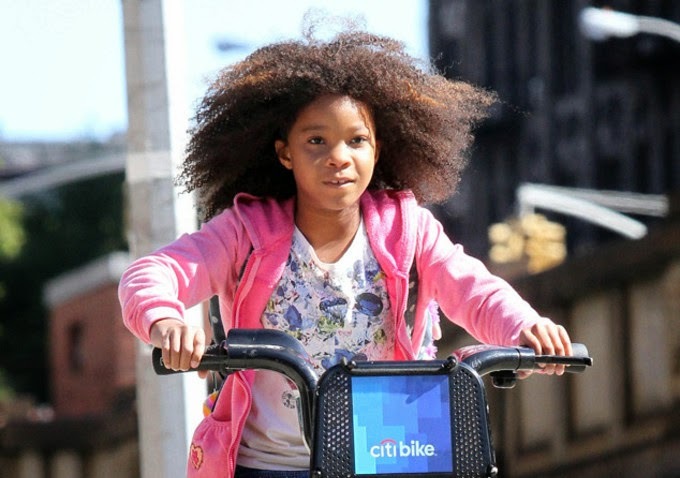 Played by Quvenzhané Wallis, who was so brilliant in the excellent film Beasts of the Southern Wild, Annie lives in New York City. She has been in foster care for almost her whole life; she was found, abandoned with a note, outside of a restaurant when she was only 4 years old. Currently, Annie lives with Miss Hannigan, a bitter, disillusioned former singer who now takes care of foster kids for income. Annie shares a room with three or four other girls, and Miss Hannigan requires them to do much of the upkeep of her home. When the foster home is visited by a caseworker, Annie finds paperwork which provides her with some of her case history. She heads out to the hall of records with the hopes of finding out who and where her birthparents are. However, She’s not able to find out very much. On the way home, she is nearly hit by a car, but is saved by Mr. Stacks, a wealthy entrepreneur who is in the middle of a dismal campaign for mayor. Stacks’ advisor suggests that it would be good for his publicity if he takes Annie in as a foster child, and so he does. He initially views her as a bother, but comes to care for her. However, one of his advisors believes that Annie has served her purpose by getting some good publicity for Stacks’ campaign, and begins to plot for her to leave. Without Stacks’ knowledge, his advisor arranges for two people to present themselves, pretending to be Annie’s parents. He has coached them so that their ruse will convince Stacks and Annie. The ploy is successful, and the imposter parents go away with Annie. She quickly learns that she has been misled, and feels heartbreakingly betrayed by Stacks, whom she had come to love. When Stacks learns about this foul play, he immediately pursues Annie’s kidnappers, rescues her, and convinces her of his desire to commit to caring for her for a lifetime. Annie is in foster care. Like many kids in care, she is resilient. She maintains her optimism and cheerfulness in spite of disappointments and unkindnesses that she experiences. Annie misses and longs for her birthparents. She dreams about them, and joins the other girls in her bedroom in a song imagining what their birthparents are like. Annie holds out hope that she will find her birthparents again. Every Friday, she waits all night by the restaurant where she was abandoned, years ago. Annie is in foster care because she was abandoned, and has no idea who or where her parents are. Most of the foster kids that I’ve worked with do know who their parents are, and are often engaged in visits and services geared towards reunification; that’s one disconnect between the movie and the real-life experiences of most kids in foster care. It seems that Annie will ultimately be adopted by Stacks; after she is rescued from her imposter parents, she and Stacks sing about spending their lives together as a family. We never do get resolution about where Annie’s actual birth parents are. Annie is courageous, smart, hopeful and optimistic, like many kids in foster care. In one scene, Annie sees her reflection and her baby picture at the same time. I can imagine that being a powerful image for anyone, but especially for people who were raised without a full knowledge of their early history. Annie doesn’t know how to read; she explains that she has been able to hide this so far. In fact, her explanation is heartbreaking, “It’s not like the whole world wants a foster kid to begin with, and plus it’s embarrassing. I didn’t want anyone to know.” When Stacks learns this, he gets Annie a tutor; she responds very well, and quickly learns how to read. Many kids in foster care struggle academically, but so often the cause is a lack of time and opportunity to learn. Stacks asks how this can happen and someone responds that in the system, “people get lost.” Foster kids are very often smart, and can thrive when given the opportunity to do so. Annie captures that. Stacks eventually puts his care for Annie in front of his ambitions of gain. He and Annie agree to tie a permanent knot, to make themselves a family. 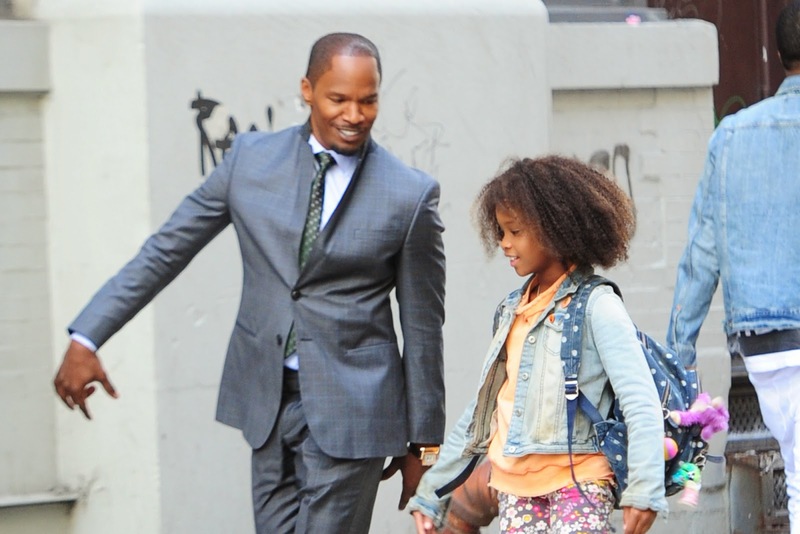 Annie spends much of the film as a commodity, first for Miss Hannigan and then for Mr. Stacks. Eventually, both adults realize and turn from their unhealthy attitudes towards Annie, and take a genuine interest in her. It is very sad that Annie waits, several hours, every Friday, for several years, outside of the restaurant where she was abandoned, hoping that her parents would come back for her. It’s perhaps even sadder that she is able to do this without her foster mother realizing. She has kept her parents’ abandonment note, and reads it often, dreaming about them. When she sings about them, she imagines that they are young, smart, and good, and says that their only mistake “was giving up me.” She pleads, “Won’t you please come get your baby?” Kids in foster care do think about their parents, and when there is no accurate information, kids tend to dream up new information. Sometimes it’s worse than realistic, sometimes it’s better than realistic, but it’s often unrealistic – and sometimes their imagined reality is hidden from those that are caring for them. This reminds me how important it is to provide kids with age-appropriate, but honest, information about their stories all along. When Annie finds her foster care record, she exclaims, “Damn! I’ve been in a lot of homes.” Sad, but true, for many kids in foster care. And it’s easy for parents and professionals to see a case file with lots of homes and assume that the child is very challenging or has lots of problematic behaviors. I’ve worked with many kids who were moved, not because of their behaviors, but because of the foster parents’ issues. It’s almost never “just” the kid. At one point, Annie thinks that Stacks will have her leave. She packs her bags, and tells him “I’ve had a lot of practice getting kicked out of places.” This could be a hard scene for kids, but it could also be helpful because, by this scene, Stacks has come to care about Annie and insists that she does not need to leave. Stacks learns to love when Annie teaches him how. She shows him the value of letting people into his heart. He says, “Annie gave me what I didn’t know I needed.” It would be better, though, if Annie learned from, and could depend on, her caretaker for emotional support, rather than vice versa. Annie’s sensitivity and emotional maturity is certainly a virtue, but it’s unfair to her to have to use it to help an adult – who is in charge of her care – to grow. Some kids in foster care have been expected previously to function in a parental role for their younger siblings – sometimes, this leads to what is sometimes called “parentified” behavior. For a while, Annie seems to be in a parental role (psychoeducationally, at least,) over Stacks. Kids watching this film should be reminded that really, it’s never a kid’s job to get a parent to be loving and kind. That’s one thing that kids should be able to take for granted. Annie keeps her desire for her birthparents secret from Stacks because she doesn’t want to bother him. This is sometimes a dynamic in adoptive families – and probably in foster families – where adoptees and foster kids don’t want to seem disloyal to their new family by revealing their retained loyalty for their first family. After longing for her birthparents for the whole movie, Annie seems to forget them once Stacks demonstrates his intention to adopt her. While permanency can help a child move on with the life that they have, it is a bit disappointing that we never do learn about Annie’s parents, and the only “parents” we find for her are kidnappers. Her imposter parents basically kidnap her. The fact that the reunion makes a mockery of Annie’s dreams, and is covered and celebrated by the New York media, could be very troubling for young viewers in foster care or adoptive families. Although she eventually becomes kinder, Miss Hannigan is generally a horrible foster mother, and she fits the unfortunate, untrue, but often-believed stereotypes of foster parents. She’s in it only for the money. 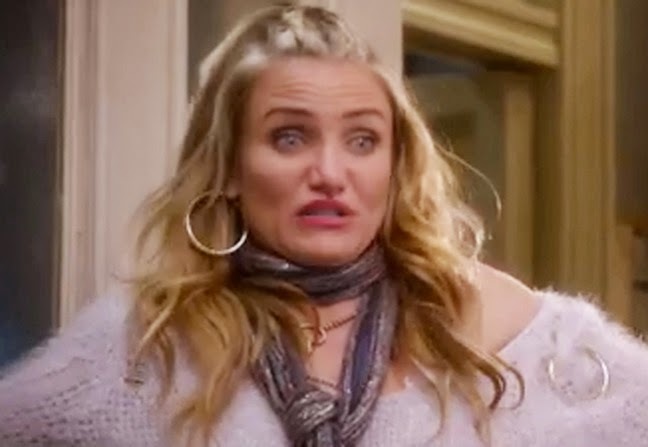 She calls Annie “you little rat.” She belittles Annie, telling her that the world doesn’t “need a smart-mouthed little rat,” and saying that because the world doesn’t need Annie, that’s why Annie’s in foster care. She also tells her, “You’re only here because I get $157 a week from the state for you.” She wakes the girls by spraying them with water, and withholds food until they complete their chores. She tells the children, “Clean like your life depends on it, because it does.” Her cruelty has impacted the foster kids’ view of the world. They sing, “Instead of kisses, we get kicked; no one cares for you a bit, when you’re a foster kid.” Miss Hannigan cruelly kicks Annie out of her home, telling her, “I told the inspector I don’t want to foster you any more. As of next week, you’re somebody else’s problem… Not a who, a where. A group home. Maybe that’ll teach you to open your mouth.” This scene could be very hard, and possibly a trigger, for kids who have suffered from disrupted placements. Miss Hannigan also cooperates in having Annie abducted by imposter parents. The two social workers in the movie aren’t very good at their jobs. The home inspector who visits Miss Hannigan leaves confidential information laying on the floor, and doesn’t seem to realize that Miss Hannigan is trying to seduce him. The administrator who serves Annie at the records office is disinterested, dismissive and rude. Some real-life social workers in the foster care system fit these stereotypes at times, but most of us actually still care deeply about the kids and families we serve, and really desire to do our work respectfully and competently. If Annie had been served by any of the workers I supervise, I think she would have had a better experience. Perhaps the most concerning thing, though, is the low level of supervision provided by the social workers. Miss Hannigan is a horrible foster mother. Mr. Stacks’ motivations for fostering Annie were very poor, and his “home study” was only superficial. The social worker even obeyed when she was told she couldn’t examine a particular room. Annie was turned over to imposter parents because the social services department didn’t examine them thoroughly. These are troubling and unfortunate ideas for the general population to have about how foster care works, and they’re (hopefully!) generally untrue. Annie’s positive attitude shines in the midst of unrealistically and unhelpfully negative stereotypes of incompetent social workers and greedy foster parents. The songs are upbeat and catchy, the film is happy, and many of the kids in the theater where I screened it seemed to enjoy it thoroughly. One girl danced throughout the credits. But I can also imagine the film being challenging for kids who have had a rough experience in foster care; it will be important for parents to tell them ahead of time that the film features a very bad foster parent who is not like most foster parents. Kids who have suffered from disrupted placements or who long to be adopted, or who long for absent birthparents might find this film very hard – for those kids, parents should probably screen it first before deciding whether to share it with their kids. Outside of those concerns, the movie is generally family-friendly, and should be good for kids ages 8 and up. Annie does exemplify several strengths of foster kids – she is hopeful, brave, resourceful, and resilient. Do you think Annie will still look for her birthparents now that Stacks is going to adopt her? How did Annie stay so hopeful, even in hard times? Is it possible to be loyal to more than one family at the same time? What can you do to help foster kids (or a particular foster kid) thrive? Would you consider mentoring, or serving as a Big Brother, Big Sister, or CASA worker? I've been looking forward to this movie for about one year now. We saw the preview when we saw "Frozen." In the original movie (not sure about the play) they do say that Annie's birth parents died in a fire. I wonder why they did away with that reference. Frankly, I'm just happy that Annie isn't in an actual orphanage, and that they've at least tried to get some of foster care right. It would have been very easy for them to just change the time without changing the elements of the story. Hi Robyn! I remember seeing the preview for Annie a long time ago, too. 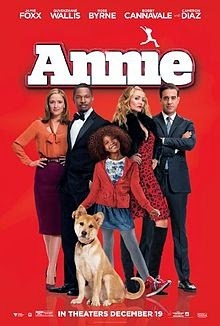 I'm not sure why, in this film, Annie's parents' absence isn't fully resolved. But, that is more common in my experience of foster care - most of the time, the kids' parents are alive, somewhere. And I value that this film makes the point that foster kids have parents, and aren't orphans. I think this is a good remake, while also noticing some things that might make it hard for some viewers. There was a book novel that gave more info on the movie, I remember reading it at Target when Annie came out, According to the novel They tried to find the parents but Annie's birth parents had already died years earlier from an illness, The dad left Annie wrapped in a blanket as an infant on Miss Hannigan's doorstep hoping he would return. I think his wife got the illness first and died and the father got sick and died a few days later. I forgot their names but it was very interesting reading about them since the movie never cleared up of what became of them. Thanks, Goldfishlover. I wasn't familiar with the story in the novel or in the earlier films - it's helpful to know what happened! Thank you for relating the film to real life foster care and adoption with remarkable insight. Hi Jessenia! Thanks for your kind words, and for sharing your site with me, and my site with your readers. I appreciate it a lot! Didn't see the movie, but aren't foster parents supposed to show a regular source of income before they foster a child? There are foster parents who "slip through the cracks of the system", but a foster parent is supposed to demonstrate some kind of source of income, even if it is an SSI check, in New York City. I was really bogthered by this portrayal of foster parents in this film. I organize a monthly a monthly support group for foster parents in Lower Manhattan and have gotten to know many of the children whom they foster. If people knew the scrutiny that foster parents have to go through, as well as the biological parents of the children sometimes, they would realize how inaccurate the portrayal of foster care is in this film. Hi Ichiou! Yes! Foster parents do need to show that they are self-supporting before they can become foster parents, at least in California. The support group you run sounds very valuable! This is my son's favorite movie. He loves watching it over and over. It comes with a digital copy, which is great because my son accidentally broke the disc taking it out of the case. Its a cute take on the classic Annie, with some modern twists. The music is catchy too.